Welcome to the world of MegaTokyo, 2032. The megacorporation Genom has turned the largest city on earth into a company town, after the disastrous Second Kanto Earthquake. Among Genoms products are the biomechanical Boomers, powerful robot workers that are as much a threat as help. In the shadow of Genom, with the threat of the Boomers, one force rises to challenge them... the Knight Sabers!<br />A vigilante group founded by the daughter of one of the Boomers creators, the Sabers challenge Genoms schemes and machines in their armored hardsuits. 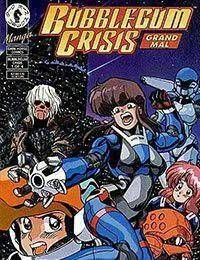 Based on the popular cyberpunk Japanese video series, pencilled by fan-favorite Adam Warren, Bubblegum Crisis is a near-future, manga-style epic technothriller that cant be missed.